Please enjoy this beautiful painting from one of our members, Mary Safranek. Thank you Mary for sharing this with our group. God Bless you! Please check back Monday January 14th for the monthly presentation and online instructions. Peace and blessings to you, this is Denise. Our next support group is this coming Monday, January 14th, from 6:30 pm to 8:00 pm. You can join us in person or online. Please look back HERE, on the website, for the presentation. Sr. Anne Marie Walsh will be leading us in prayer and discussion. Please invite a friend or family member. Location: 2256 S. Logan Street, Our Lady of Lourdes Classical School 6th Grade Classroom. Park by the gym. Our door opens directly into the courtyard. You will need to call in and be able to access our website. To join us remotely, please call UBER CONFERENCE before 6:30 pm at (720) 735-7025. Sr. Anne Marie will guide us through the presentation live. 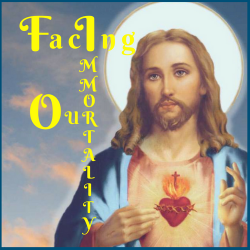 To view the download, please link https://facingourimmortality.org.